We have come a long way from the first event in a bar in Bermondsey in 2009, but in front of almost 800 of Europe’s top tech entrepreneurs and investors, The Europas Conference and Awards played host to the cream of Europe’s tech startup industry. Over 600 participants attended this year for the largely invitation-only daytime conference and around 800 attended the Awards ceremony. All the pictures are here and a short video is below (more is coming). The editorially-curated Conference and Awards for European technology startups announced The Best Tech Startups in Europe, at least according to the combined votes of over 10,000 public votes and a panel of 19 industry judges made up of European journalists, entrepreneurs and investors. TechCrunch was the exclusive media sponsor for The Europas, and all attendees, nominees and winners of the Europas Awards were presented with discounts to TechCrunch Disrupt in London, later this year. Citymapper took home the Best Transport Startup, Best Mobile Startup and the ultimate Grand Prix prize. The annual celebration of Europe’s brightest and best tech companies, The Europas saw over 50 speakers come together in Central London, just ahead of the industry Awards finale, where over 25 of Europe’s best startups and founders were honoured by their peers. It even featured a fire-breathing robotic horse. Over the last few weeks, startups have been able to either apply for an award or be nominated by a third party. A judging panel has then selected a shortlist of nominees, which has been submitted to public voting. The results were combined to determine the most forward-thinking and innovative European tech companies across 25 categories. As a first this year, The Europas featured a new award category honouring startups aiding children in the world’s toughest environments, sponsored by UNICEF UK. The winner in that category was Simprints which is building a mobile biometric scanner and open-source software to empower the mobile tools used by researchers, NGOs and governments around the world. It’s been an incredible year for European startups, which have continued on their upward curve over the last few years. We’ve seen some very significant fund-raisings, some amazing new products and a mounting number of exits, whether through acquisition or IPO. Those honoured consisted of an amazing group of companies and people. The Winner: Spotify – A favourite with the judges and with the industry voting, Spotify has changed the music industry with an incredible product that continues to delight users and change the music industry. The Winner: Deliveroo – Deliveroo optimizes food ordering and delivery by linking consumers with tablets in restaurants. It’s basically magic. And they recently raised $25M from Accel Partners. The Winner: Brainly – Launched in 2009 in Krakow, Poland, Brainly is now the world’s largest social learning network enabling users to help each other with school work problems. 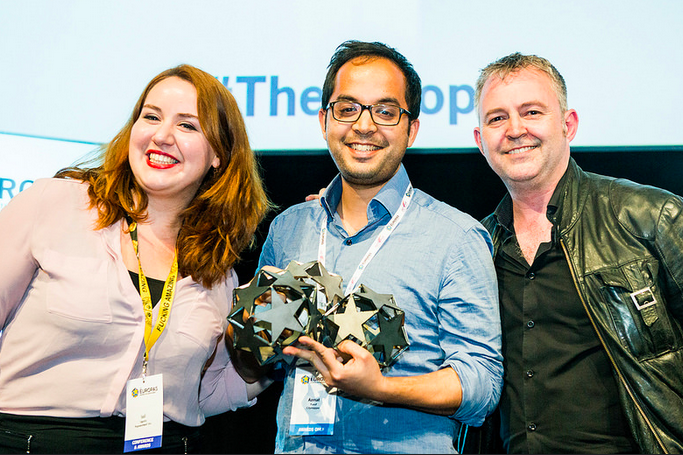 The Winner: TechStars – Featuring perhaps the biggest Demo Day London has seen in the last year, and a popular choice amongst voters, TechStars London continues to grow from strength to strength. The Winner is: Brandwatch – Brandwatch has raised $31.7M to date, expanded to the US and empowered brands and agencies to make smarter, data-driven decisions. The Winner: Space Ape Games – Raising Rival Kingdoms and $28M in funding, Space Ape Games is on a roll right now. The Winner: Citymapper – Citymapper has proved to be the ultimate transport app for global cities. It’s making cities smart event before Smart Cities have arrived. The Winner: Adyen – Straight out of Amsterdam, Adyan has raised $266M and is going global with its payment platform. The Winner: Pipedrive – This powerful sales pipeline software has changed the game for CRM. The Winner: Kano – It’s been a rocket-fuelled ride for Kano, which has taken the Raspberry Pi and made it accessible to the world. The Winner: Hassle.com – After raising $7M this online marketplace that has matched busy people with local, trusted cleaners has grown at a blistering rate. The Winner: Bellabeat – After being built out of Croatia, Bellabeat joined Y-Combinator and is now creating beautiful hardware health products for women worldwide. The Winner: Digital Shadows – This cyber monitoring service has raised $8M and a few eyebrows with its awesome platform. The Winner: Blockchain – This web-based bitcoin platform makes using bitcoin safe, easy, and secure for all consumers and businesses worldwide. The Winner: Citymapper – Citymapper is slowly but quietly changing the world of transportation in global cities and is used daily by millions of users. The Winner: Sigfox – After $151.3M of funding it is literally connecting the world of objects. The Winner: SwiftKey – Both judges and you, the industry, chose Swiftkey as your coolest technology, one which has been lauded recently by none other than Professor Stephen Hawking. The Winner: Lyst – Almost the Internet of Fashion, Lyst is slowly changing the business model for the fashion industry itself by predicting new trends. The Winner: Point Nine Capital – Running out of Berlin and Germany, Point Nine has been consistently investing in some of the hottest companies out of Europe to date, and has become the go-to firm for many early stage entrepreneurs. The Winner: Aimed At Improving Society Impossible.com – Built literally to make the world a better place when skills are shared freely, Impossible has captured our imagination around what’s really possible in the sharing economy. The Winner: Accel Partners – While it never went away, Accel has come roaring back, backing many of the winners tonight and re-energising its team over the last year. The Winner: Transferwise (Taavet Hinrikus & Kristo Kaarmann) – You would have had to live under a rock not to notice Transferwise’ disruptive entry into the market over the last couple of years, and it’s now making the international money transfer market break out in a cold sweat. The Winner: Wallapop – A sleeping dragon of Europe, Wallapop has come from almost nowhere (ok Barcelona) to become one of the hottest apps in Europe and the US. Look out Craigslist. The Winner: SimPrints Technologies – Simprints has developed a unique biometric system customized for the developing world. High accuracy is ensured through two-finger identification and optimized matching algorithms. The Winner: Citymapper – When you find yourself using an app like Citymapper multiple times a day, you know it is a game-changer. This is a technical team building a highly disruptive product. It could almost be a Waze for Humans.